What to do when you open up a brand new Hammock Gear tarp and realize that there are no guylines or rigging to attach it to trees or stakes? 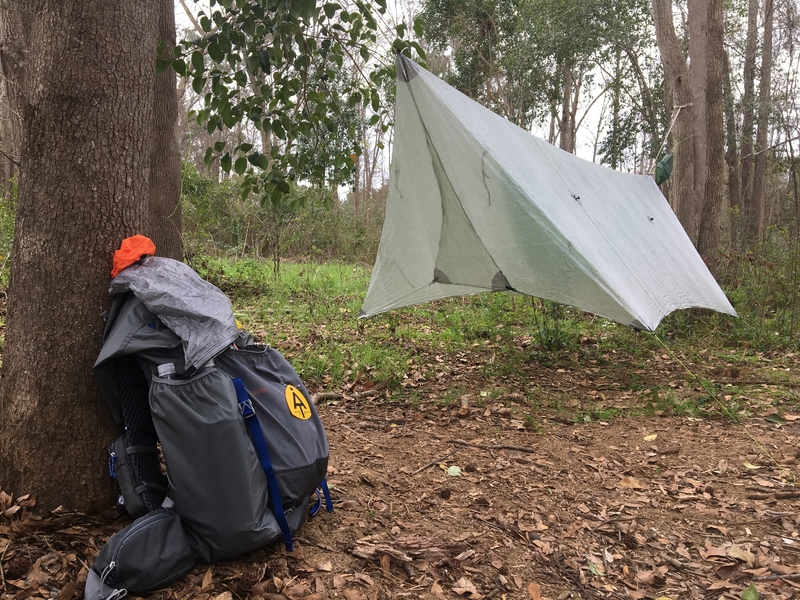 In the future, maybe Hammock Gear will offer a basic rigging package, but many hammockers love to customize their tarp rigging, so the lack of accessories isn’t necessarily a bad thing. After deciding to jump into the world of hammock camping, I did some research on The Trek and other sites, ending up with a lightweight US-made tarp: the standard cuben fiber tarp with doors from Hammock Gear. The tarp arrived with zero rigging, and after an email inquiring about this, I checked back on the website and noticed: does not come with guy lines were bold and highlighted. After no less than 100 times setting this up on my AT thru-hike, here’s what I learned. Basic tarp rigging secures the ridge line and corners, while the sides of the tarp can be pulled out to add space and brace the tarp in harsh weather conditions. Rigging can also be included on doors if the tarp has them. 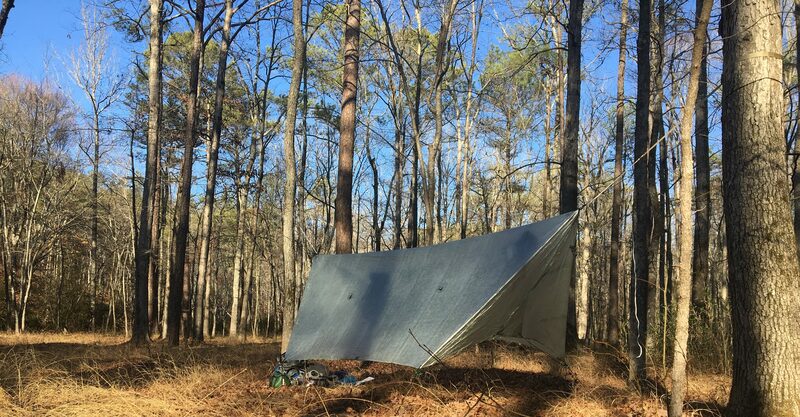 The ridgeline is the peak in the middle of the tarp, attached to trees at each end—or fixed with trekking poles for a ground setup. There are two basic options for ridgeline rigging. The ridgeline tie-outs can be secured only on the ends (referred to as end-only tie-outs) or a continuous ridgeline can be used, with a line running under the entire length of the tarp. I tried both during my thru-hike, and the end-only was much easier, and less line means less weight. For more info on continuous ridgelines, check out this video. The first thing you’ll need for rigging is some type of cordage—I used lash it or zing it, a 1.75mm, durable line that also works with some of the hardware Dutchwear gear makes for securing tarps. The cheapest and lightest way to rig the end-only ridgelines is with knots. I used this method for several hundred miles of my AT hike, and several overnight trips with no issues. You’ll need a length of cordage 10-12 feet, attached to each ridgeline D-ring on the tarp. The rope can be attached with two half hitches, larks head knot after a loop is made (pictured below), or similar. After the knot is attached to the D-ring, take the cord and run it behind the anchor (tree) then run it back through the D-ring and pull the line semi snug before finished by tying a taut line hitch on the same rope for putting tension on the line (See image below). If the taut line hitch is tied right, tension is increased on the line by moving the knot towards the anchor. One side is adjusted to keep the tarp over the hammock, and the process is repeated on the other side before any final adjustments are made. This method is described in detail in The Ultimate Hang, a useful book for hammockers of all levels. After setting up tarps with knots, there may come a point where hardware options are researched to make setup faster and easier. While hardware adds weight to the tarp system, it makes the tarp easier to set up at the end of the day and in inclement weather. When anyone mentions tarp hardware, the name that comes up in most of the hiker trash establishments is Dutchwear. During my hike I used a lot of Dutch’s stuff and was very happy with it, plus their legendary customer service. For my end-only tie-outs I used The Wasp on each ridgeline D-ring. Follow the instructions and be careful not to over-tighten the tarp. Every once in a while you’ll see hammockers who decide not to stake the corners, or forget their stakes. Rocks can be used instead of stakes if stakes disappear happen to from your backpack on the way to camp. A simple corner tie out can consist of two half hitches connecting to the D-ring, plus a stake through a bight. Another slightly heavier (but more functional) option is to make line tensioners for the corners to keep the tarp taught during setup and use. Most cuben fiber tarp information says that the tarp does not sag, so line tensioners are not needed. 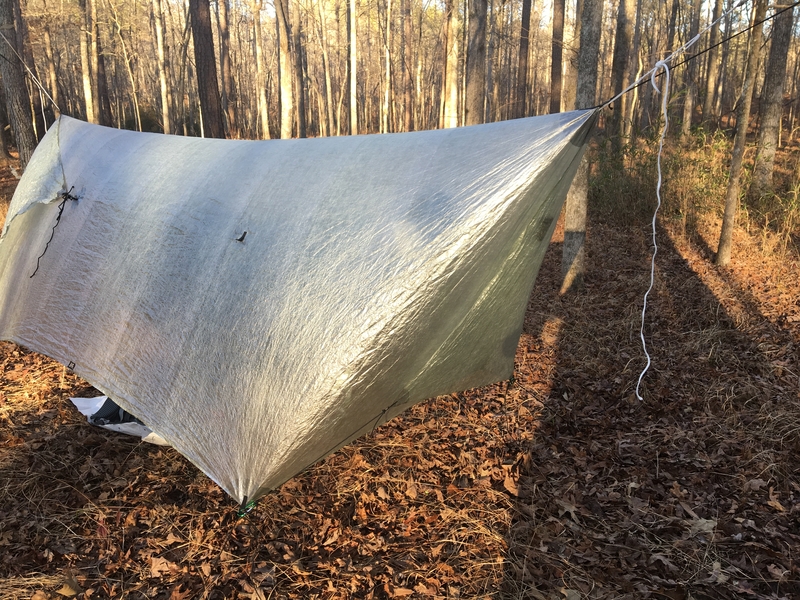 But I used them during my hike and they help keep the tarp taught if it shifts while all the stakes are being placed or if the hammock suspension nudges the tarp when you climb in the hammock. There are companies that sell pre-made tensioners, but they are very simple and cheap to make yourself. This method takes a piece of shock cord with a knot tied on both ends, ties a clove hitch on the inside of one of the ends, then puts slack in the rope before tying another clove hitch. This option didn’t work well for me which is why I went with Option 2, but hammock master Shug made a detailed video about how to make them if you’re interested. When I tried this method the clove hitch would always pop over the knot when the line was under tension. I believe this could have been solved with bigger shock cord but I never had any issues with Option 2. The line tensioners I had for my AT thru-hike were made by taking a piece of shock cord, doubling it, and then tying a knot in the end. Once this was done I would tie a bowline and run the knot through the shock cord loop. After putting slack in the line, a clove hitch is tied below the knot to create the tensioner. This method is detailed again in the book The Ultimate Hang. Either option can work, and I suggest at least trying them both. Without them, most tarps that aren’t cuben fiber will sag, which could result in the tarp coming into contact with other gear and possibly getting it wet. Now that the tarp is equipped with lines for the corners the last step is to secure the tarp to the ground using a stake. Form a bight in the line, and use the stake to secure the line. To tie a bight, make a loop in the line and reach through the loop to side of the line going to the tarp. Pull that line back through the loop and then place the stake in the loop. This method works great, can be adjusted easily, and when you take the tarp down and pull the stake out, and there’s no knot to untie. Choosing the stakes is a personal preference. I went with the standard titanium shepherd hook stakes. These stakes are light, but in high wind or loose soil they can be ripped out of the ground. I have firsthand experience searching for stakes in the middle of the night in a rain storm. To prevent searching for a stake in the dark, make sure to put locally sourced rocks on top of these stakes after pushing them all the way into the ground. During my hike I saw lots of folks using a new carbon fiber stakes from ZPacks. I used four of these stakes for ~ 1,500 miles of the AT and never had one come out due to inclement weather. The Hammock Gear tarp has two side pullouts that can be used to brace the tarp in heavy wind or rain or to make a little more room inside the hammock. Honestly, I maybe used these three times my whole thru-hike. Using trekking poles and locally sourced rocks, these pullouts can be used effectively. For my tarp I tied a larks head on a small line, attached it to one D-ring pull out, then ran it through the other D ring and tied a taut line hitch to tighten and loosen as required. On this line, a prusik knot can be used on this main line to be moved from side to side and attached to a guyline. Below, the side pullouts are used and tied to a tree instead of run over a trekking pole and staked out. The pull outs can be useful when the tarp is pitched low at a shallow angle, and will keep it from slapping you in the face while you try to sleep in high winds. A tarp equipped with doors requires a little extra rigging. Either it can be simple with four lines and four extra stakes, or you can use shock cord and fasteners to avoid the stakes. This awesome video from Adventure Alan will show you what to do. The doors on my tarp are rigged just like Alan’s, and while I have some tie backs on mine and don’t use the clips to hold the doors open, I used them to hold the doors closed almost every night. This blocked wind and rain and also provided a little extra privacy. A well-rigged hammock tarp is possible…. setting it up right can be a little more difficult. Don’t forget to practice before you set out on your trip, and leave a comment if you have any questions. I’d like to add that Outdoor Adventures has an excellent video on rigging side pullouts. All it requires is two trekking poles and some cordage. No extra trees or stakes required. It does require a continuous ridgeline though so the trekking poles aren’t rubbing the ridgeline. Ah, sounds like a great idea. I looked through their youtube to attempt to find the link the video and wasn’t able to find it. I used the side pullouts on my tarp so infrequently that most of the time there was either trees near by or I just used rocks. Please put the video link in comments if available. Here you go. He gets to the pull outs around 7:43. Ah, he did a pole mod with his trekking poles. They actually sell kits with poles in them to do that. Doing it with trekking poles is a great idea. I heard some rumor of people doing that but never saw it in person. Thanks for sharing! 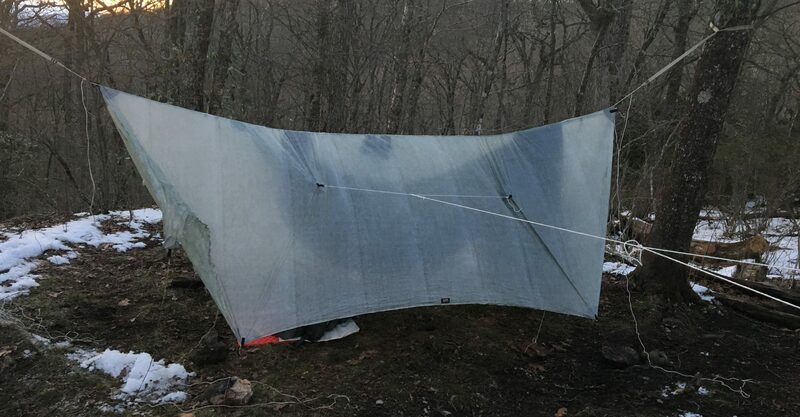 I like the idea of the continuous ridge line, I string it a little loose and use it for drying things and a place to sling my hammock up out of the way while I´m cooking or changing and moving around under the tarp. Thanks for a really useful article, well written. Hopefully more tarp makers will begin including instructions like these with their hammocks. Glad the article helped out. I have a ridgeline on my hammock that I used to hang stuff to dry. I haven’t completely given up on the continuous ridgeline but its not part of my normal tarp set up for now.